I have had so many makeup bags over the years. Big ones, small ones, but I really like this one. QUANSHENG Travel Makeup Bag is not a really big bag, but it holds so much. I really like that it has one side for liquid products, it's waterproof, and that means a lot especially when you're traveling. I've had several spill accidents when I was traveling and what a mess that can be. I've had shampoo spilled in my clothes, that's almost enough to ruin a trip. With this bag that's not a worry. 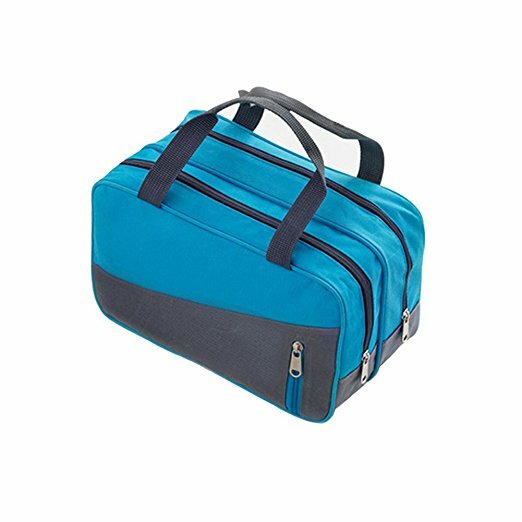 All liquid products can be safely stored in the waterproof side of this makeup bag. The other side had plenty of room for all of your dry products. Plus there are 2 different zippered pouches on both sides of the bag. I like this makeup bag enough to use for my daily needs instead of only using it for traveling. I have my foundation bottles and moisturizers and face creams in the waterproof side and the dry side I keep my eye shadows, blush, powder in the other side. My makeup brushes fit nicely in the zipper pouch on the front. This is perfect for men or women and can be used for toiletries, dirty clothes, medicine,etc. I love finding a nice bag like this to keep things organized. Keeping everything organized not only keeps from getting lost but also keeps this neat and tidy.